High Efficiency Heating are market leaders in bespoke heating and hot water installations. Director Andy Baxter has been in the industry now for over 35 years and this experience has been invaluable with the onset of renewable technology. They also supply and install heat pumps, biomass and solar thermal systems. As part of building a bespoke system business management system High Efficiency Heating wanted to reliably inform and communicate with their customers from confirmation of their appointment to when we are on the way to the job. The fastest and most reliable way to inform customers of their appointment information was by text message. Therefore via Textlocal’s API, text message services were integrated into their business management system for automatic customer updates. Automatic text messages mean greater communication with all customers in a time and cost effective manner. This has greatly increased their professional status with their customers. Overall, text messaging has proven to increase their general business by approximately 8%. 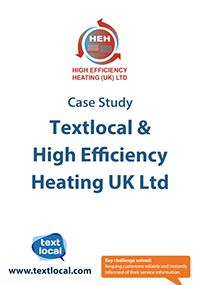 Download a copy of High Efficiency Heating UK Ltd’s case study.